Scott Pilgrim is a weakling, socially awkward, doesn’t drink, rarely gets a haircut, only wears his favourite T-shirts. If you just read your own bio, this is your new favourite movie. Adapted from Brian O’Malley’s comic-book saga with breakneck stylistic verve by director Edgar Wright, Scott Pilgrim Vs The World is the ultimate geek wish-fulfilment flick. There are no size-zero superhotties here, just girls who are freckled and fleshy. The good-looking guys are evil, the good guys are limp and loveable. It’s a world where chicks who don’t want to know you suddenly invite you into bed. A world where you’re the hero. Final Fantasy? Hell yeah. Cue the plot scroll: having met the girl of his dreams – literally, as an unrecognisably dorked-up Mary Elizabeth Winstead rollerblades through a desert dreamscape – 22-year-old bass guitarist Scott must defeat her seven evil exes to win her heart. Why? No reason. It’s just a cool idea. Proving himself a modern culture-mulcher to rival Tarantino, Wright delivers a relentless mash-up of Manga, videogames and comic-books that you’ve never quite seen before on the big-screen. Stat boxes intro new characters (Name, Relationship, Age, Rating). Word-sounds go “KROW” and “THONK”. A pee bar depletes when Scott visits the toilet. Why? See above. Which is all very cute, but Wright’s movie only starts punching above its weight when Scott does. Ready… Fight! Before you can say, ‘Aaaaaarrrrjuuuken!’, Scott Pilgrim ka-booms with the first in a series of awesome smackdowns that dazzle with speed, style and choreography. Scott knows kung fu. Edgar Wright knows how to shoot action. Since Shaun Of The Dead and Hot Fuzz, this guy has levelled up. Often slashing the frame into jagged split-screens, Wright’s startling visual mojo swoops in direct from Japan (the Mecca of animation and videogames) and the cine-tricks just keep coming in waves. Opponents shatter into a spray of coins. A Donkey Kong hammer appears from nowhere. Final Fantasy summons monsters battle it out in a Guitar Hero duel. This is sizzle-reel cinema, a movie for Generation ADD that attempts to tell a story using only the cool bits. But that’s what stops it snatching a high score. Scott Pilgrim is the Scott Pilgrim trailer for two hours. Like the coin-op arcades it references so brilliantly, Wright’s gimmicky hyper-flick is too long and too repetitive. Without a compelling plot to provide a pupose, it often feels like a jumble of nudges and winks, from Scott’s Mortal Kombat-stylee final opponent to the green ray that defeats a former son of Krypton. Breathlessly rushing around with not much to say, Scott Pilgrim is witty and clever but missing a true heart. Scott’s health-bar never really flashes red – even if he dies, you know he can always hit ‘Continue’. It’s a game where there’s nothing to lose, to gain or to care about. Then again, pick-up-and-play: that’s part of why it’s such a blast. Boosted by a terrific cast, the action scores a big power-up from ex-men Chris Evans (Human Torch as an egomani-actor), Brandon Routh (Superman as a vegan rock-god with Dr Manhattan powers) and Kieran Culkin’s aces turn as Pilgrim’s gay housemate. 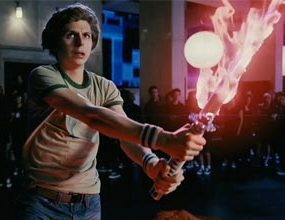 As for Hollywood’s geek-chic king Cera, his shrugging slacker is too much of a drip to really w00t! for, but you couldn’t customise a better on-screen avatar for the nerd-herd. And they’re the ones who’ll decide if this fun, fizzy beat-’em-up persuades major studios to trust Wright with a lot more pocket money. He’s proved he has the ability to tap the pulse of a major pop-subculture. It might not be a box-office smash – for that, Wright will have to pwn the mainstream (film fans with good haircuts, social lives and beer in the fridge). But if each one of the world’s Pilgrims buys a cinema ticket, he could be a cult Hollywood player who’s hard to beat. Surely we deserve better than this cartoon mess?